The 4th Latin American Conference on Drug Policy took place in early December, gathering academics, NGOs and policy makers to discuss the latest policies and best practice from Latin America and beyond in the field of drug policy. The conference aimed to reframe the drug policy reform debate as a social justice issue for all those caught up in the drug trade, from production to consumption. 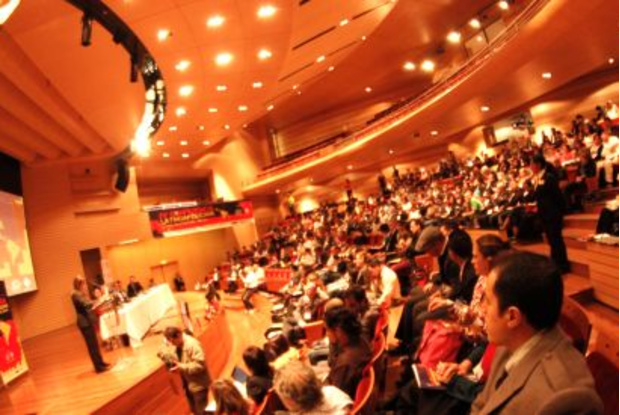 The event was ideally located in Bogota, Colombia. Colombia has long been known for its prohibitive approach to drugs, under the influence of the United States. For the past year or so, however, Colombia has been at the forefront of drug policy reform debates, with President Santos calling for an end to the war on drugs, and for the holding of a United Nations General Assembly Special Session to review current strategies by 2016 alongside the governments of Mexico and Guatemala. The city of Bogota itself has witnessed some interesting developments this year, with the adoption of a drug policy based on public health rather than solely on harsh law enforcement, and in particular the establishment of CAMAD – mobile medical centres for people who use drugs. The conference featured many interesting sessions and roundtables on issues related to public health, human rights, social inclusion, reducing violence, and options for drug policy reform, including legal regulation. The sessions focused both on reform movements in Latin America, and on best practice examples from other regions of the world that are relevant to the Latin American context. The legalisation of cannabis was a key topic, focusing on the new developments in the U.S. States of Washington and Colorado – where it will soon be possible to legally produce, sell and use the substance for recreational purposes – and on Uruguay’s proposal to create a regulated market for cannabis. For a full account of the conference’s sessions, please click here. The Declaration of Colombian coca producers calling for the Colombian government to protect their socio-economic rights, as well as their right to produce and use the coca leaf for traditional purposes. The Declaration of the Latin American Coalition of Cannabis Activists (CLAC) calling for the international community to support the Uruguayan cannabis reform movement. The Declaration of the newly established Latin American Network of People Who Use Drugs (LANPUD) calling for the fulfilment of their human rights, and their meaningful involvement in the review and adoption of decisions that affect them. The Declaration of young people in Latin America calling for more involvement of young people in the design and implementation of drug policies. Finally, for the first time, the conference included a side event on production issues, with the involvement of twenty coca farmers from across Colombia. The discussions focused on the failures of crop eradication campaigns implemented so far, as well as the limited effects of alternative development efforts, mainly because these strategies took little account of the local context and needs of subsistence farmers involved in coca production. Participants also discussed importance of producing, selling and using the coca leaf for cultural and traditional purposes.